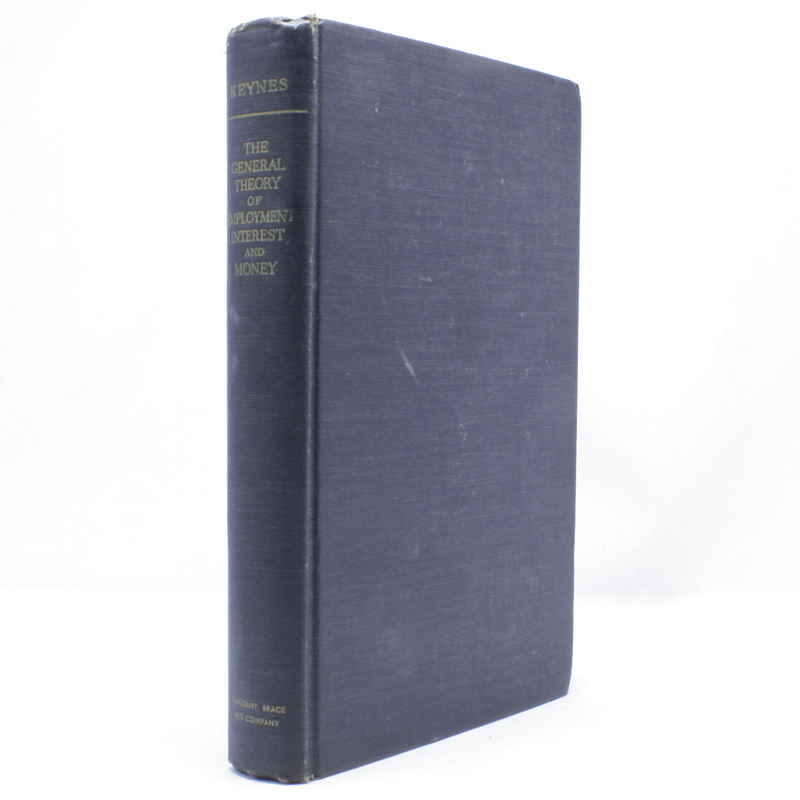 GENERAL THEORY EMPLOYMENT INTEREST & MONEY/ECONOMICS - IFA Vintage and Current Book Library - Index Fund Advisors, Inc. THE GENERAL THEORY OF EMPLOYMENT INTEREST AND MONEY. BY JOHN MAYNARD KEYNES. New York: Harcourt, Brace and Company, c.1935. First Edition. Rare. A solid First American edition of this classic work, arguably one of the most influential and controversial economic monographs of the past 100 years. Keynes wrote this book to explain theoretically the causes of the Great Depression that began with the Stock market crash of 1929, but it fundamentally changed the way governments regulate their economies and it provided the foundations for Macroeconomic theories. Keynes argued in this book he undermined the very foundations of orthodox economics and he put forth a radically new way of thinking about unemployment. Many younger economists enthusiastically adopted Keynesan ideas while others were quite hostile. "The General Theory of Emplyment, Interest and Money" has been described as probably the most influential social science treatise of the 20th Century, in that it quickly and permanently changed the way the world looked at the economy and the role of government in society. This book is solid and attractive, without damage, and it has the original hardcover cloth binding. With the owner signature and bookplate of Prof. David Apter. Published more than 70 years ago, this First American edition is now very scarce, as comparable copies usually sell for between $130 and $250. Such a nice copy is not likely to come up for sale again on ebay. From the Preface: "This book is chiefly addressed to my fellow economists. I hope that it will be intelligible to others. But its main purpose is to deal with difficult questions of theory, and only in the second place with the applications of this theory to practice...I have thought it important, not only to explain my own point of view, but also to show in what respects it departs from the prevailing theory. Those, who are strongly wedded to that I shall call, 'the classical theory,' will fluctuate, I expect, between a belief that I am quite wrong and a belief that I am saying nothing new...My controversial passages are aimed at providing some material for an answer; and I must ask forgiveness if, in the pursuit of sharp distinctions, my controversy is itself too keen...This book has evolved into what is primarily a study of the forces which determine changes in the scale of output and employment as a whole...The composition of this book has been for the author a long struggle of escape, and so must the reading of it be for most readers if the author's assault upon them is to be successful-a struggle of escape from habitual modes of thought and expression. The ideas which are here expressed so laboriously are extremely simple and should be obvious. The difficulty lies, not in the new ideas, but in escaping from the old ones, which ramify, for those brought up as most of us have been, into every corner of our minds." From the text: "I HAVE called this book the General Theory of Employment, Interest and Money, placing the emphasis on the prefix general. The object of such a title is to contrast the character of my arguments and conclusions with those of theclassical theory of the subject, upon which I was brought up and which dominates the economic thought, both practical and theoretical, of the governing and academic classes of this generation, as it has for a hundred years past. I shall argue that the postulates of the classical theory are applicable to a special case only and not to the general case, the situation which it assumes being a limiting point of the possible positions of equilibrium. Moreover, the characteristics of the special case assumed by the classical theory happen not to be those of the economic society which we actually live, with the result that its teaching is misleading and disastrous if we attempt to apply it to the facts of experience." Contents include: The General Theory; The Postulates of the Classical Economics; The Principle of Effective Demand; the Choice of Units; Expectation as Determining Output and Employment; The Definition of Income, Saving and Investment; the Meaning of Saving and Investment, Further considered; The Propensity to Consume: the Objective Factors; the Propensity to consume: The Subjective Factors; The Marginal Propensity to Consume and the Multiplier; The Marginal Efficiency of Capital; The State of Long-term Expectation; The General Theory of the Rate of Interest; The Classical Theory of the Rate of Interest; the Psychological and business Incentives to Liquidity; Sundry Observations on the Nature of Capital; The essential Properties of Interest and Money; The General Theory of Employment re-stated; Changes in Money-Wages; The Employment Function; The theory of Prices; Notes on the Trade Cycle; Notes on mercantilism, the Usury Laws, Stamped Money and Theories of Under-Consumption; concluding Notes on the Social Philosophy towards which the General Theory might lead; Index. According to wikipedia: "John Maynard Keynes, 1st Baron Keynes CB (1883-1946) was a British economist whose ideas, called Keynesian economics, had a major impact on modern economic and political theory as well as on many governments' fiscal policies. He advocated interventionist government policy, by which the government would use fiscal and monetary measures to mitigate the adverse effects of economic recessions, depressions and booms. He is one of the fathers of modern theoretical macroeconomics... Keynes accepted a lectureship at Cambridge in economics funded personally by Alfred Marshall, from which position he began to build his reputation. Soon he was appointed to the Royal Commission on Indian Currency and Finance, where he showed his considerable talent at applying economic theory to practical problems. His expertise was in demand during the First World War. He worked for the Adviser to the Chancellor of the Exchequer and to the Treasury on Financial and Economic Questions. Among his responsibilities were the design of terms of credit between Britain and its continental allies during the war, and the acquisition of scarce currencies.At this latter endeavor Keynes’ “nerve and mastery became legendary,” in the words of Robert Lekachman, as in the case where he managed to put together — with difficulty — a small supply of Spanish pesetas and sold them all to break the market: it worked, and pesetas became much less scarce and expensive. These accomplishments led eventually to the appointment that would have a huge effect on Keynes’ life and career: financial representative for the Treasury to the 1919 Paris Peace Conference. Keynes' career lifted off as an adviser to the British finance department from 1915 Ã¢â‚¬â€œ 1919 during World War I, and their representative at the Versailles peace conference in 1919. His observations appeared in the highly influential book The Economic Consequences of the Peace in 1919, followed by A Revision of the Treaty in 1922... In hismagnum opus, The General Theory of Employment, Interest, and Money (1936), Keynes laid the foundation for the branch of economics termed "Macroeconomics" today. Based on the methods devised by Alfred Marshall, he argued that macroeconomic relationships differ from their microeconomic counterparts because the ceteris paribus clauses applicable to different levels of aggregation differ. The innovation in his core argument is to stop taking prices and wages as perfectly flexible, arguing instead for a certain degree of stickiness. Thanks to stickiness, it is established that the interaction of "aggregate demand" (in his sense) and "aggregate supply" (in his sense) may lead to stable unemployment equilibria. His work on employment went against the idea that the market ultimately settles at a state of full employment - a central tenet of Classical economists. Instead he argued that there exists a continuum of equilibria, the full employment equilibrium position being just one of them. (This idea underlies the choice of the title "General Theory": the classical theory being just a special case.) His main contribution can be seen in establishing an approach to macroeconomics that maintains its relationship to the underlying microeconomic behaviors, but assumes a form qualitatively different from microeconomic models. (This contrasts with the assumption made in New Classical Economics where macro relationships are modelled analogously to micro-relationships, Ã¢â€ â€™Robert Lucas, Jr.).He assumed that (marginal) labour productivity decreases with expanding employment. This is incompatible with the empirical findings summarized in Okun's Law. He combined this position with the marginal productivity theory of wages, implying that real wages decrease with increasing employment. This was shown to be empirically incorrect by the economist Dunlop, and Keynes accepted this. Keynes also suggested in the General Theory that inflation would occur only near "full employment" (in his sense), but it has been observed in many cases that inflation creeps up in states of severe underemployment (Stagflation). The assumption entertained by Keynes that inflation can only occur near full employment is still maintained in modern macroeconomics (Ã¢â€ â€™NAIRU). Keynes held that the cause of unemployment is a too high rate of savings, or insufficient investment expenditure. He conjectured that the amount of labour supplied is different when the decrease in real wages is due to a decrease in the money wage, than when it is due to an increase in the price level, assuming money wages stay constant. This conjecture relates to the "actual attitudes of workers" and is "not theoretically fundamental," although the New Keynesian economics emphasizes this point. Octavo - sized hardcover book; xii 403 pages of text. Very Good condition: no torn or missing pages; some pencil markings, underlining and marginal notations; very mild scattered foxing; owner's bookplate and name on front endpapers: "David E. Apter"; slight browning to gutters of endpapers; hinges a bit loose. Original publisher's hardcover binding with gilt lettering on the spine, light fraying to spinetips and corners, minor spots. A solid copy of this scarce item.